DedicatedSolutions offers four database options for you. Select the best suitable type based on your preferences and requirements, and experience the high performance. Highly talented and experienced professionals are managing your mission critical Oracle database at DedicatedSolutions. We will support you in installation, troubleshooting, disaster recovery, and scaling up process of the database, while keeping the database up and running without compromising performance. If you have advanced requirements, you can hire our DBA experts. customers, whose server is running SQL, with the help of our dedicated and highly experienced resources. You can hire our specialists for your advanced SQL requirements. PostgreSQL Server or simply Postgres, is an object-relational database management system (ORDBMS). This open source technology provides utmost importance to extensibility and compliance of standards. PostgreSQL is able to run on Linux, UNIX, and Windows while offering Reliability, efficiency, data integrity, and perfection. Relational databases are poorly suited to rapidly incorporate new data types and are not recommended for the storage of semi-structured or unstructured data. NoSQL databases can help with big data plans to get the flood of data in the grip of the companies. We offer NoSQL systems to process much larger amounts of data to store, without hitting performance limits. Our default settings cannot be always a good fit for your requirements. 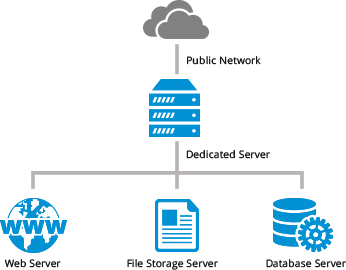 This is why we have made our Single server as well as Data base cluster hosting architectures highly customizable. The single Database Server is a perfect match, if your web and database use are not that heavy. This architecture is presented to you while keeping performance in mind. 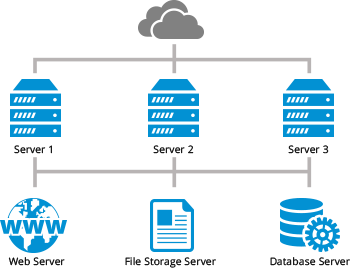 Single Database Server is capable of hosting Web servers, website scripts, databases, and all other related files. Hosting different elements on different folders within the server is the best method in order to improve redundancy. Use Redundant Array of Independent Disks (RAID) technology for the best hosting experience. Cluster Database Server -a high availability solution- provides redundancy improvement, scalability, and high bandwidth for your high web and database usage requirements without compromising performance. A dedicated server is allocated solely for the purpose of hosting your database and it does not allow running web server or any other services. This infrastructure allocates different hardware for running web server and other services. Web, database, and file storage are properly segmented in Cluster Database Server in order to improve the performance while making the whole infrastructure simple. Apache Hadoop is a java based open source framework for scalable, reliable, and distributed storage and processing of big data that are available on computer clusters. This framework allows scaling up from single server to many servers which are able to offer local computation and storage. Cloud Big Data facilitates you to provision a robust, Hadoop powered, environment for your data processing requirements. We manage Hadoop for maintaining your big data environment. This allows you to optimize configuration while enjoying reduced operational burden. We manage private cloud environment and maintain your big data infrastructure to leverage the full efficiency of the dedicated server so that you can focus on your core business.